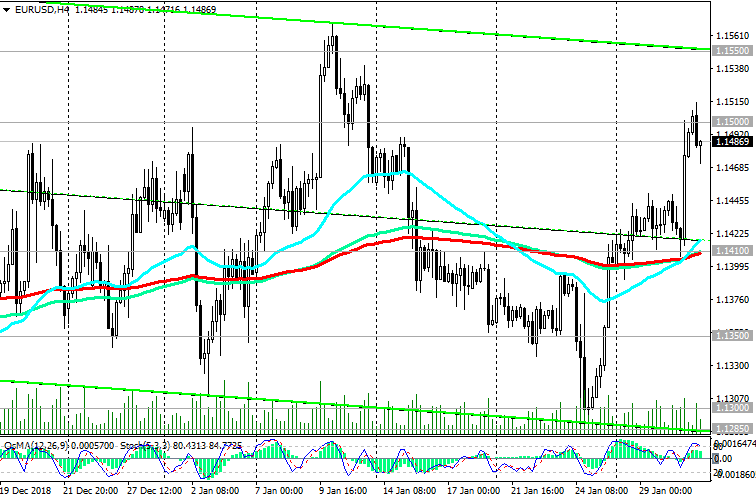 At the regular meeting the ECB last Thursday kept its current monetary policy unchanged. ECB President Mario Draghi reported on the prevalence of downside risks for the Eurozone economy, including protectionism in international trade and geopolitical tensions. Earlier, the central bank noted a general balance of risks. Last Wednesday, the Fed also did not change its monetary policy, maintaining interest rates at the same level. 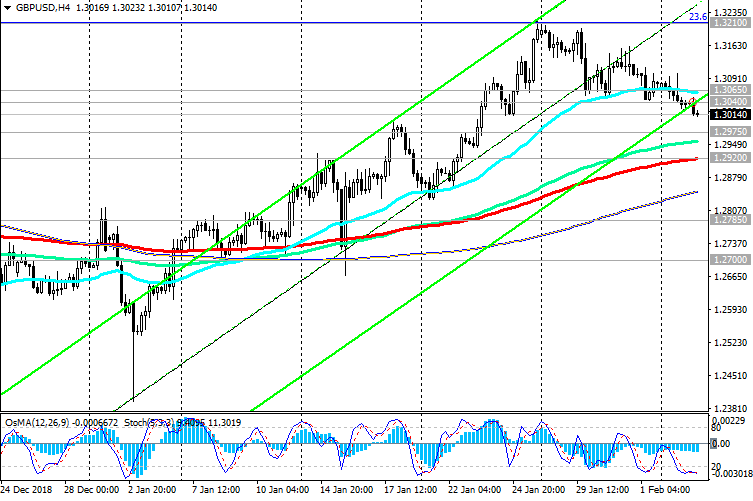 The cautious position of the US Federal Reserve and the statements of its head Jerome Powell that "the arguments in favor of raising rates have weakened a bit", raised the EUR / USD to a 3-week high near the 1.1515 mark. Powell reiterated that future policy will be “completely dependent on data”. Market participants expect the Fed will not raise rates this year. 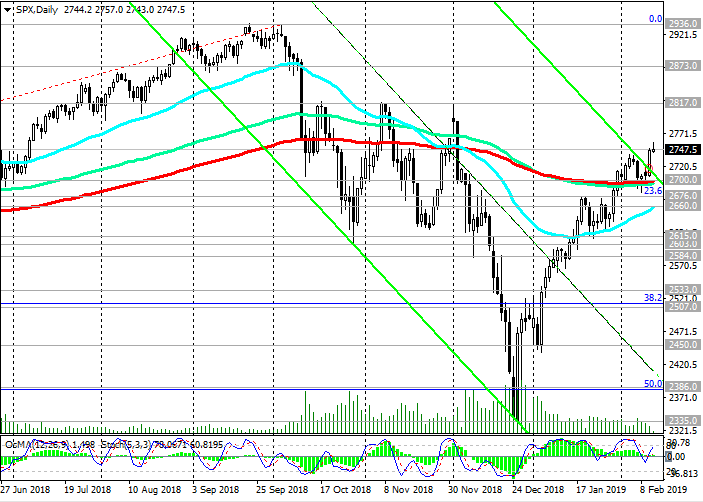 Now, after the statements of Powell, data from the US labor market, expected on Friday, will attract increased attention of market participants. Data worse than the forecast values and data for December will weaken the likelihood of further tightening of monetary policy and adversely affect the dollar quotes. From the news today it is worth paying attention to the publication (from 13:30 to 15:00 GMT) of US macro data: data on unemployment applications last week and sales of new homes in November. Positive macro data will provide short-term support for the dollar. Conversely, weak data will adversely affect the dollar quotes and support the EUR / USD pair, which is falling on Thursday after the publication of the weaker-than-expected 4-quarter Eurozone GDP data. According to Eurostat, in the 4th quarter, Eurozone GDP grew by +0.2% (+1.2% in annual terms). Thus, the GDP growth in the Eurozone in 2018 was 1.8% versus 2.4% in 2017. The data again indicate a slowdown in the European economy in 2018. Meanwhile, the EUR / USD holds positions reached last Thursday near an important resistance level of 1.1500 (EMA144 on the daily chart). The OsMA and Stochastic indicators on the 4-hour, daily charts still recommend long positions. In the current situation, long positions with targets at resistance levels of 1.1500 (EMA144 on the daily chart), 1.1550 (EMA200 on the daily chart) look preferable. The alternative scenario assumes a resumption of the decline. The signal for the development of this scenario will be the breakdown of support levels 1.1418 (ЕМА200 on the 1-hour chart), 1.1410 with targets at support levels 1.1300, 1.1285 (Fibonacci level 23.6% of the correction to the fall from 1.3900 level, which began in May 2014), 1.1270 (December lows), 1.1215 (November and year lows). The dollar is falling on Friday, and gold quotes continue to rise. Investors are waiting for publication (at 13:30 GMT) data from the US labor market in January. These data (along with data on GDP and inflation) are crucial for the central bank, including the Fed, in determining the direction and pace of monetary policy. Strong performance is expected, despite the fact that the number of new jobs in the non-agricultural sector of the US economy in January increased by 165,000 (after a growth in the same period in December by 312,000). The growth in the number of jobs above 150,000 per month is a good indicator. At the same time, unemployment will remain at the lowest levels for many years (3.9%). If the data is confirmed, the dollar may receive short-term support and strengthen. More important for the further dynamics of the dollar and the price of gold is that the Fed has signaled a pause in the process of further raising interest rates. Last Wednesday, the Fed kept the current monetary policy unchanged, and Fed Chairman Jerome Powell said that "there was a little less reason to raise rates", and future policies would "completely depend on data". A more cautious monetary policy of the Fed, as well as in a situation of worsening growth prospects for the world economy and international trade conflicts, political struggle in Washington, attenuation of fiscal stimulus will help to maintain the demand for gold and the continued growth of its quotes. However, during the publication of data from the US labor market, a surge in volatility is expected in trading across the entire financial market. Probably more cautious investors would prefer to stay out of the market during this time period. 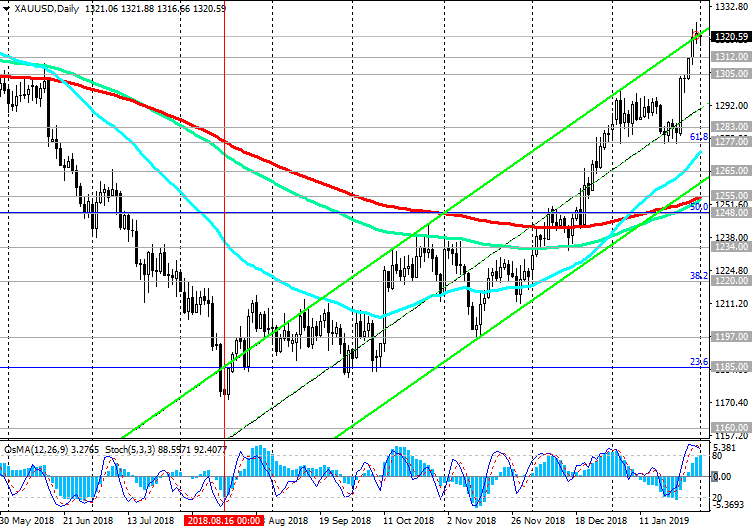 Meanwhile, the XAU / USD pair is trading near multi-month highs and a mark of 1320.00, through which the upper line of the ascending channel on the daily chart passes. There is a strong positive impulse, and in case of continued growth, the targets are resistance levels of 1357.00 (2017 highs), 1370.00 (start of a decline wave and Fibonacci level 100%), 1375.00 (2016 highs). 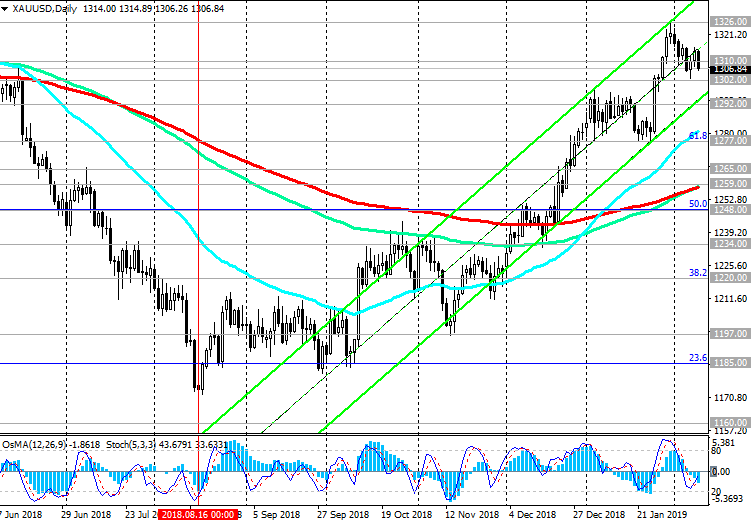 An alternative scenario involves the breakdown of support levels of 1283.00 (EMA200 on the 4-hour chart), 1277.00 and the resumption of the bearish gold trend. 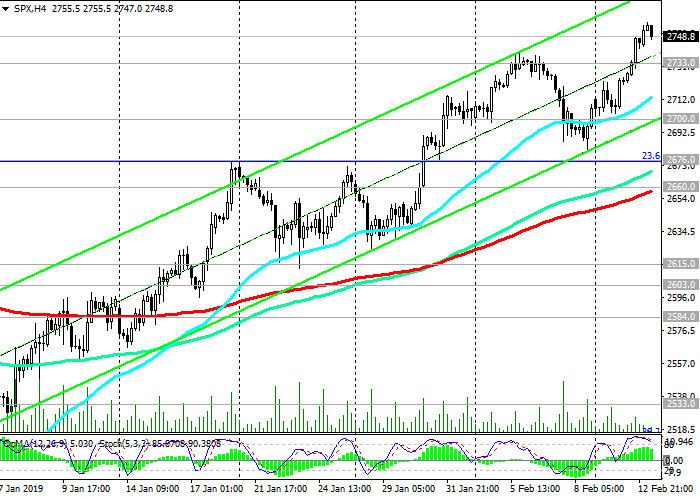 Below the support level of 1255.00 short positions will become preferable again. So far, long positions are preferred. 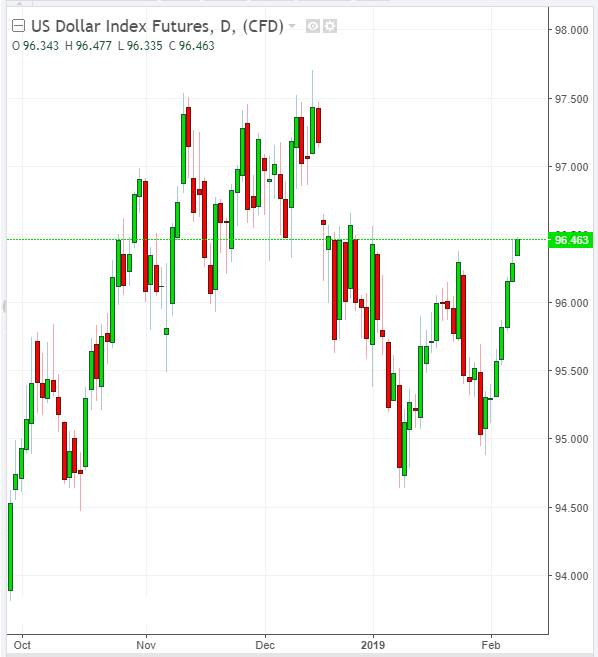 The US dollar is trading higher on Monday, and the DXY dollar index futures at the beginning of the European session is at 95.46, 12 points higher than the opening price of the trading day. As reported last Friday by the US Department of Labor, the number of non-agricultural jobs increased by 304,000 in January, while the average hourly wage in the private sector increased by 3.2% from the previous year. The forecast was +170,000 jobs. Despite the fact that unemployment rose to 4% from 3.9%, it still remains at its lowest level in the last 10 years. Investors considered the report to be generally positive, which gave the US dollar an impetus for further growth. At the same time, the AUD / USD is falling from the opening of the trading day on Monday and at the beginning of the European trading session, trading near the 0.7230 mark. On Tuesday, the attention of traders will be directed to the publication at 03:30 (GMT) of the decision on the RBA interest rate. It is expected that the central bank of Australia will leave its key interest rate unchanged, at a record low of 1.5%. Market participants will closely monitor the rhetoric of the RBA's accompanying statement. The fall in housing prices, the slowdown in consumer spending, weak wage growth, the trade conflict between the United States and China, and the uncertain prospects for the global economy have become factors in the slowdown in GDP growth in 2019. Any concerns of the RBA leadership regarding the growth of the country's economy can be considered by investors as a signal to resume sales of the Australian dollar. 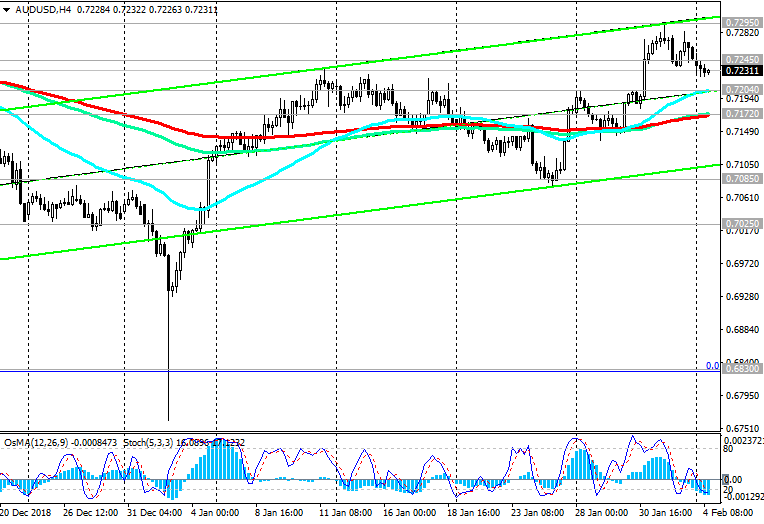 Meanwhile, AUD / USD is declining, attempting to consolidate below the support level of 0.7245 (EMA144 on the daily chart). 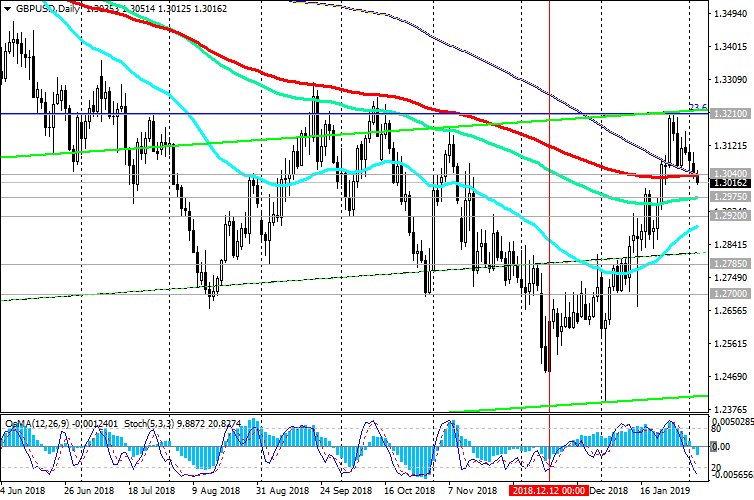 In the event of a breakdown of short-term support levels of 0.7204 (EMA200 on the 1-hour chart), 0.7172 (EMA200 on the 4-hour chart, EMA50 on the daily chart) AUD / USD will move towards the support levels of 0.7085, 0.7025 with the prospect of further decline with long-term goals at the levels support 0.6910 (lows of September 2015), 0.6830 (lows of 2016). An alternative scenario assumes the resumption of upward correction. 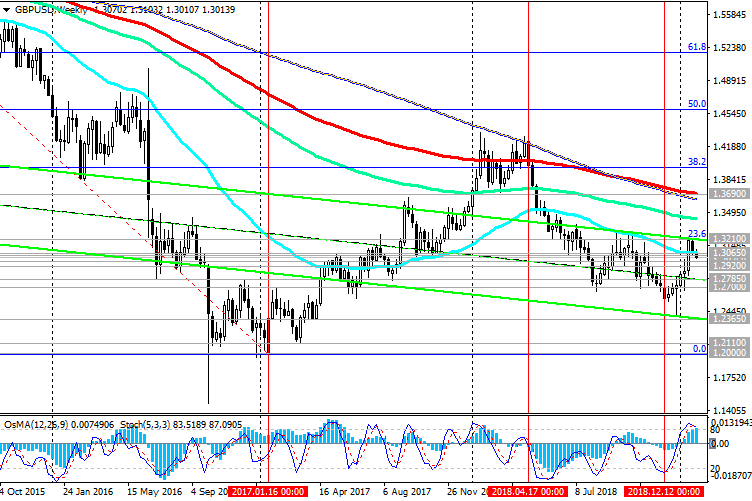 In case of a breakdown of the key resistance level of 0.7295 AUD / USD, it will go to resistance levels of 0.7385, 0.7460 (Fibonacci 23.6% of the correction to the wave of decline in the pair from July 2017 and the level of 0.9500. The minimum of this wave is near the level of 0.6830). Further growth is unlikely due to a number of fundamental factors. After, on Tuesday morning, the RB of Australia expectedly kept the interest rate unchanged, the volatility of trading on the foreign exchange market at the beginning of the European session decreased significantly. Major dollar currency pairs, with the exception of AUD / USD, are traded on Tuesday in a narrow range. The US dollar and the market as a whole do not have enough drivers for further movement. 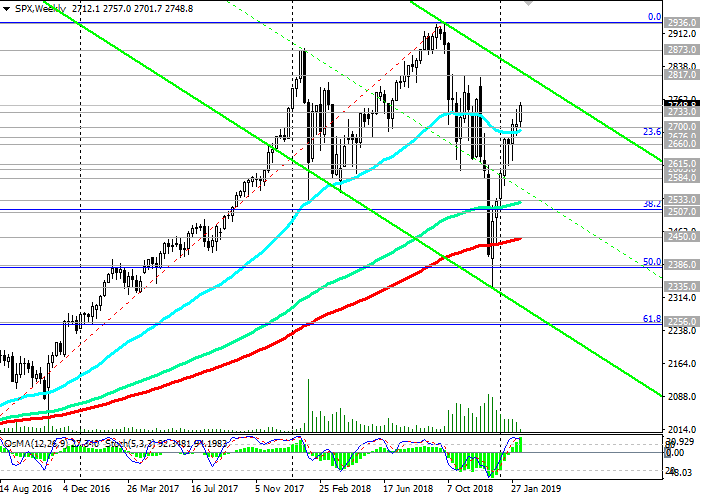 Probably, such a driver will be the publication in the first half of the US trading session (15:00 GMT) of the report of the Institute for Supply Management (ISM) on activity in the non-manufacturing sector of the United States. Economists expect the non-production composite index from the Institute for Supply Management (ISM) in January to fall to 57.1 from 58.0 in December. Although an index value above 50 indicates an increase in activity, a relative decline in the indicator may have a short-term negative impact on the dollar. Market participants will also closely monitor the performance of the US President Donald Trump in Congress later on Tuesday with an annual message on the state of the country. 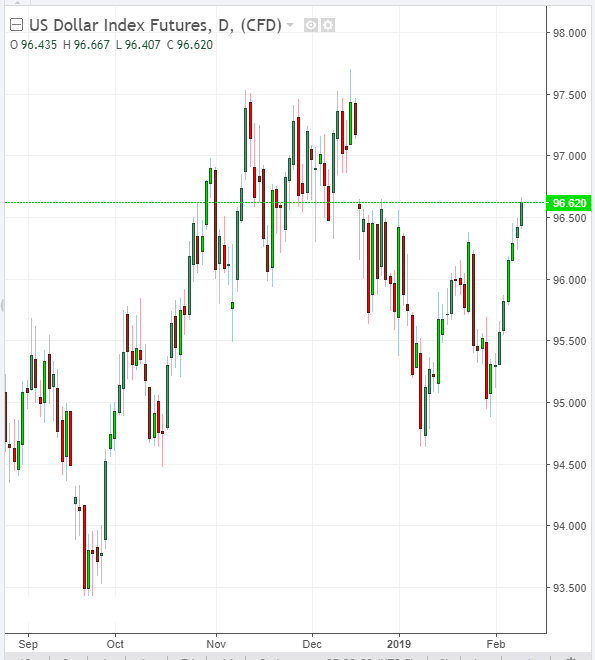 Any signals from Trump about a positive change in the sides' positions in the negotiations between the US and China will support the dollar, which needs a strong positive impetus for further growth after the Fed meeting last week. As you know, on Wednesday the Fed kept its current monetary policy unchanged and signaled its intentions to be more restrained in regard to further rate increases. Fed Chairman Jerome Powell said at a press conference that "there was a little less reason to raise rates". According to the central bank executives, the current level of inflationary pressure does not force the Fed to take any action. Many investors do not expect further increases in the Federal Reserve rates this year. Moreover, futures on the Fed rates on Monday indicated an 11% chance of lowering the Fed rates by the end of the year. Last week, this probability was 21%, according to the CME Group. 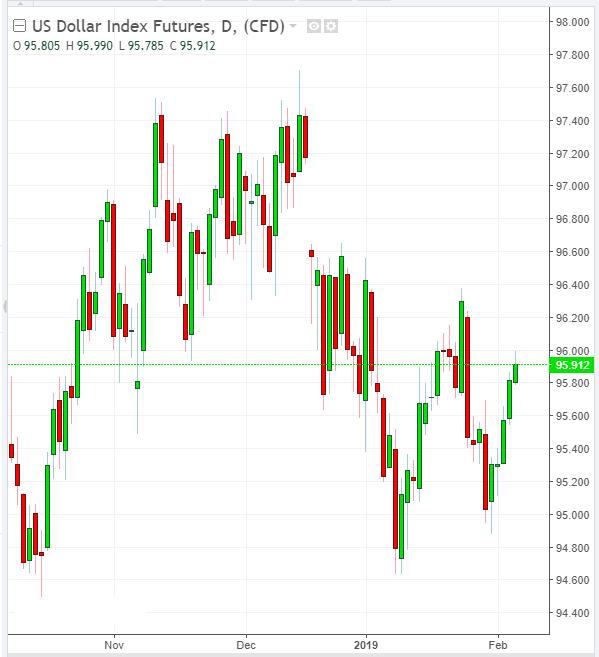 The dollar index DXY, reflecting its value against a basket of 6 currencies, is moderately rising from the opening of the trading day on Tuesday. 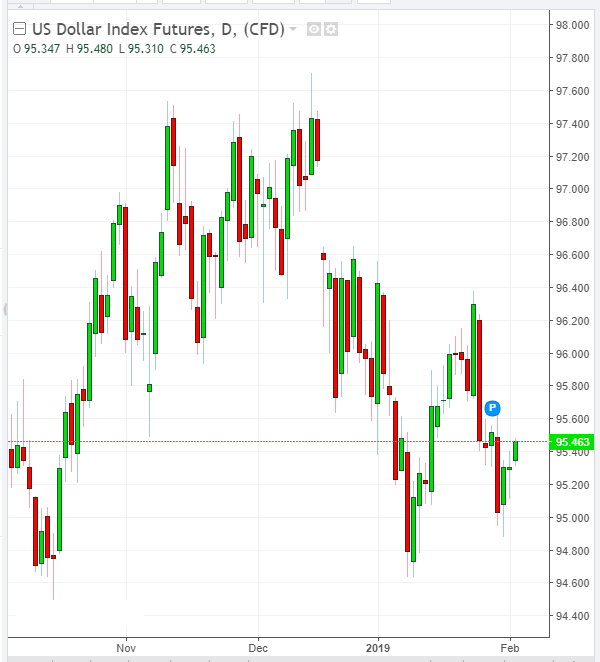 At the beginning of the European session, futures for the DXY dollar index traded near the 95.68 mark, 10 points higher than the opening price of the trading day. 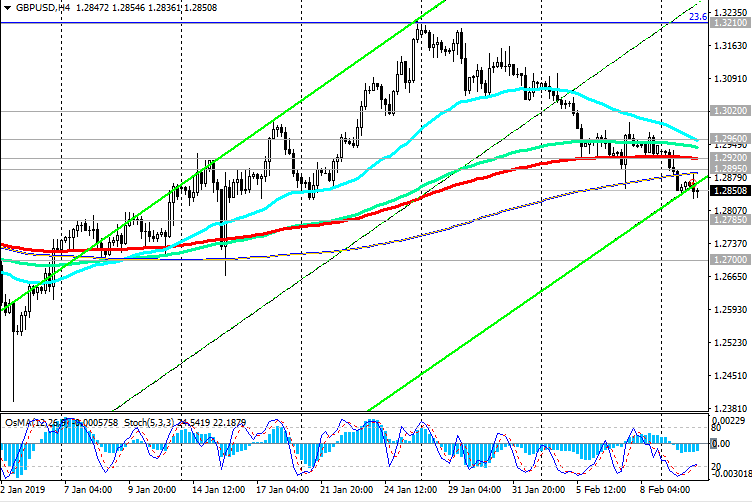 GBP / USD has fallen on Tuesday for 4 days in a row. Weak macro data, unresolved situation with the UK exit from the EU, as well as worsening situation in the world, volatility in financial markets and restraint of the Federal Reserve System can force the Bank of England to take a softer stance with regard to its monetary policy. Any hints of the bank towards a softer policy will cause a sharp decline in the pound. 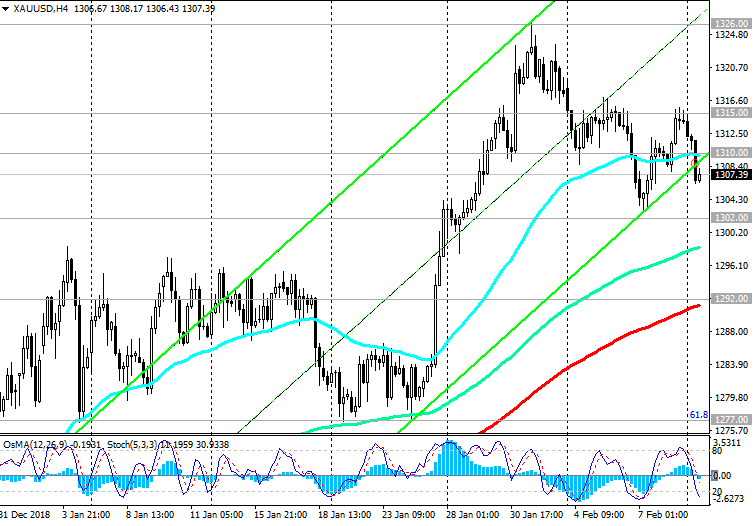 Indicators OsMA and Stochastic on the 1-hour, 4-hour, daily charts switched to the short positions. 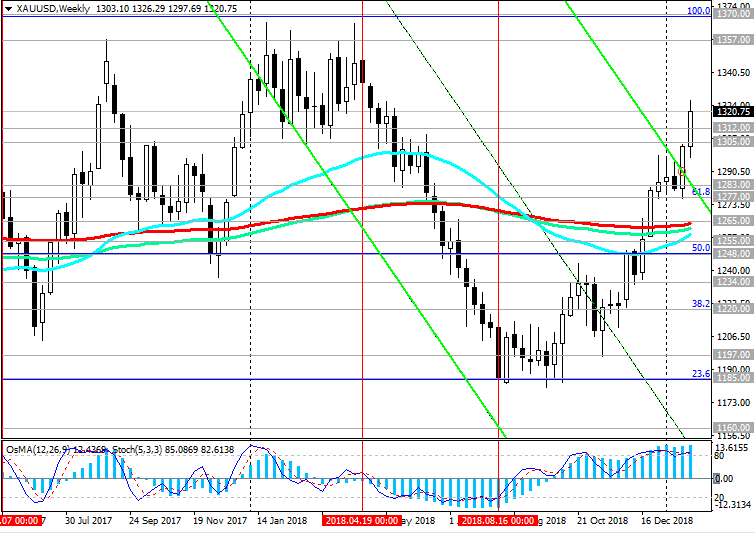 After GBP / USD is fixed in the zone below the support level of 1.2920 (ЕМА50 on the daily chart, ЕМА200 on the 4-hour chart) short positions will again become relevant. The main trend is still bearish. The objectives of the decline are support levels of 1.2600 (lows of June 2017), 1.2485, 1.2365. 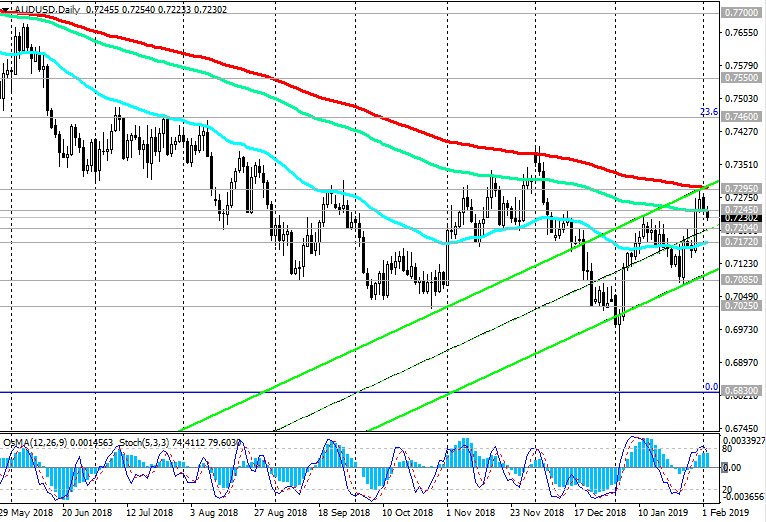 On Wednesday, AUD / USD broke through important short-term support levels of 0.7210 (EMA200 on the 1-hour chart), 0.7172 (EMA200 on the 4-hour chart, EMA50 on the daily chart) and continues to decline towards support levels of 0.7085, 0.7025. On Friday (00:30 GMT), the RBA will comment on the prospects for its monetary policy. There will also be given forecasts regarding the further growth of the Australian economy, labor market, inflation. 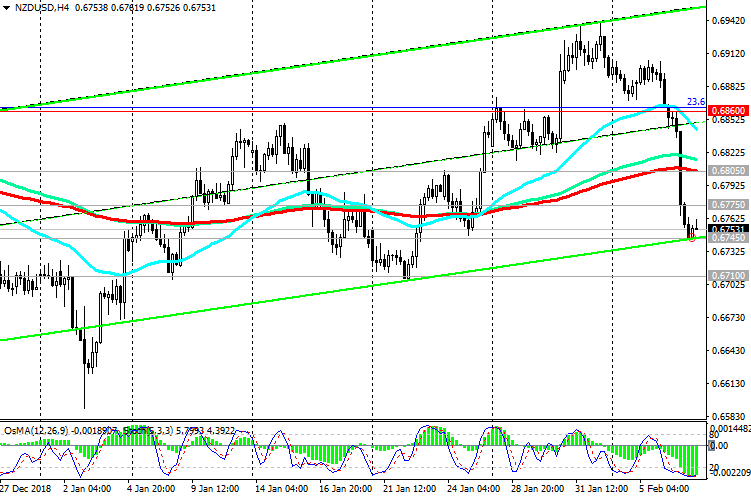 If forecasts turn out to be negative, then the Australian dollar and AUD / USD will continue to decline. Long-term reduction targets are at support levels of 0.6910 (lows of September 2015), 0.6830 (lows of 2016). Negative dynamics prevails; below the resistance level 0.7172 short positions are preferable. Randal Quarles, deputy chairman of the US Federal Reserve System for Supervision of the Banking Sector, said Wednesday that he was worried about the negative impact of events taking place abroad. “Global risks are probably the most significant”, said Quarles, pointing in particular to the slowdown in China’s GDP growth. Chinese imports occupy the lion’s share of New Zealand exports. 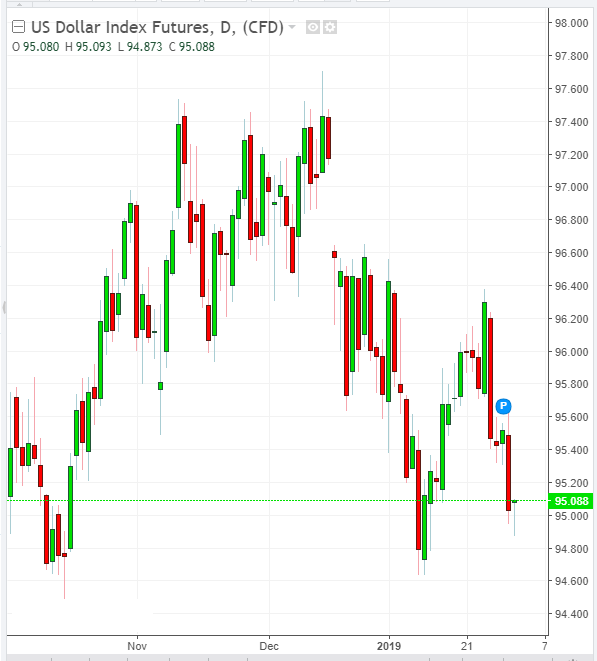 The slowdown of the world and Chinese economies have the most negative impact on commodity prices, as well as on commodity currencies, including the New Zealand dollar. On Thursday, the NZD declines after the publication on the eve of the weaker-than-expected data from the New Zealand labor market. According to the Statistics Bureau of New Zealand, unemployment in the country increased in the 4th quarter of 2018 (4.3% versus 4.0% in the 3rd quarter and 4.1%, as expected, according to the forecast). 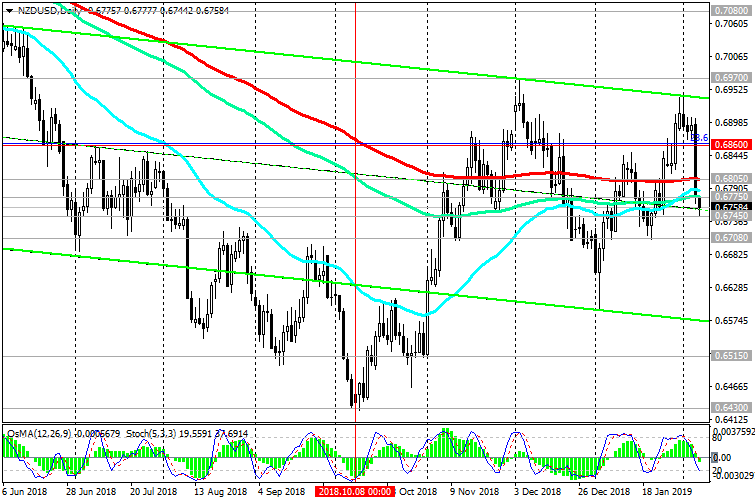 At the beginning of the US trading session, NZD / USD is trading below key levels of 0.6805 (ЕМА200 on the daily chart), 0.6775 (ЕМА144 on the daily chart), near 0.6745, through which the bottom line of the ascending channel passes on the 4-hour chart. In the event of a breakdown of the support level of 0.6745, NZD / USD will go to the nearest local support level of 0.6710, a breakdown of which will mean the return of NZD / USD to a bearish trend. Only after NZD / USD returns to the zone above the resistance level of 0.6805, will it be possible to return to NZD / USD purchases again. 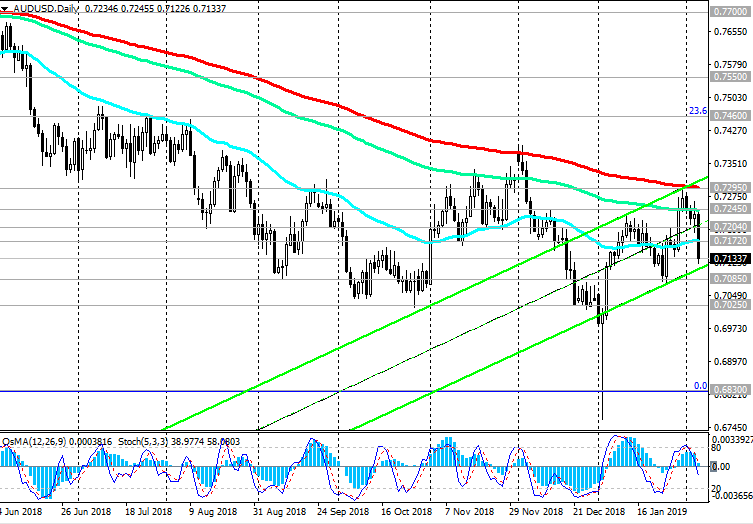 Probably, before the RBNZ meeting on monetary policy, which will take place on February 12, the New Zealand dollar will remain under pressure, given the overall negative external macroeconomic background. If the RBNZ signals a propensity to reduce the rate, the New Zealand dollar may decline significantly. If the Fed again announces the possibility of a rate hike this year, the negative fundamental background for the New Zealand dollar in its dynamics against the US dollar will increase significantly. Commodity currencies, such as New Zealand, Australian, Canadian dollars, fell on Thursday and continue to decline on Friday amid investor concerns about the global economy. 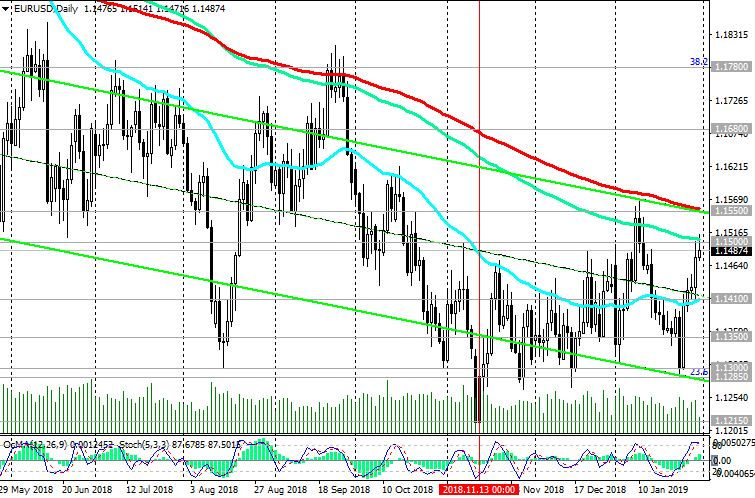 The USD / CAD pair is trading before the start of the US trading session near the 1.3317 mark, above the important short-term support level of 1.3275 (ЕМА50 on the daily chart, ЕМА200 on the 4-hour chart). Investors are once again concerned about the state of the global economy, which causes the purchase of defensive assets and the dollar. At the beginning of the European session on Friday, DXY dollar index futures traded at 96.46, 12 points higher than the opening price of the trading day. White House economic adviser Larry Cudlow told the Fox Business Network that China and the United States are still far from a deal in trade. Hopes for a new trade agreement between the countries weakened after Cudlow's statements. If a trade truce is not concluded, then on March 2, the United States will raise duties on imports of goods from China by another $ 200 billion to 25% from 10%. This can have a very negative impact on stock markets and commodity prices, as well as causing investors to withdraw into defensive assets and the dollar. Declining prices are also putting pressure on CAD quotes. On Thursday, WTI crude oil prices closed at a low from January 28 at $52.64 per barrel. Above key support levels of 1.3185 (ЕМА144 on the daily chart), 1.3135 (ЕМА200 on the daily chart), 1.3100 (ЕМА50 on the weekly chart) positive dynamics of USD / CAD prevails. Long positions are preferred. Growth targets - resistance levels of 1.3450 (Fibonacci level 23.6% of the downward correction to the pair's growth in the global uptrend since September 2012 and 0.9700), 1.3665 (2018 highs), 1.3790 (2017 highs). 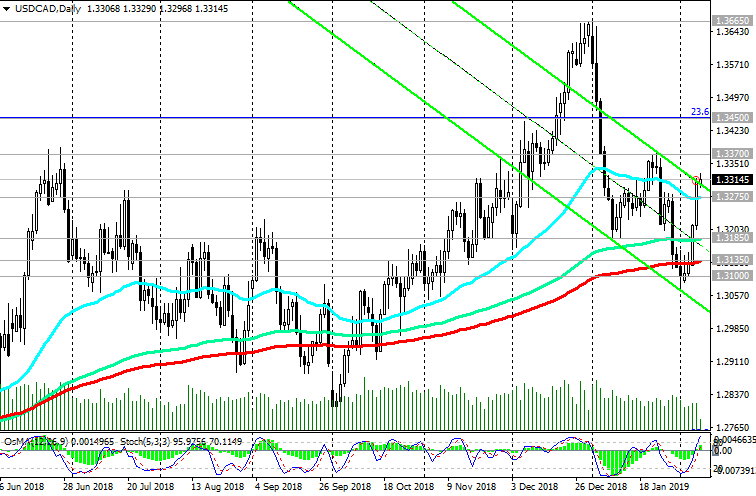 The breakdown of the important short-term support level of 1.3275 will be the beginning of the development of an alternative scenario for reducing USD / CAD with targets at the support levels of 1.3135, 1.3100. The dollar is rising again at the beginning of the new week. DXY dollar index futures traded at the beginning of the European trading session near the 96.62 mark, almost 20 points above the opening price of the trading day. 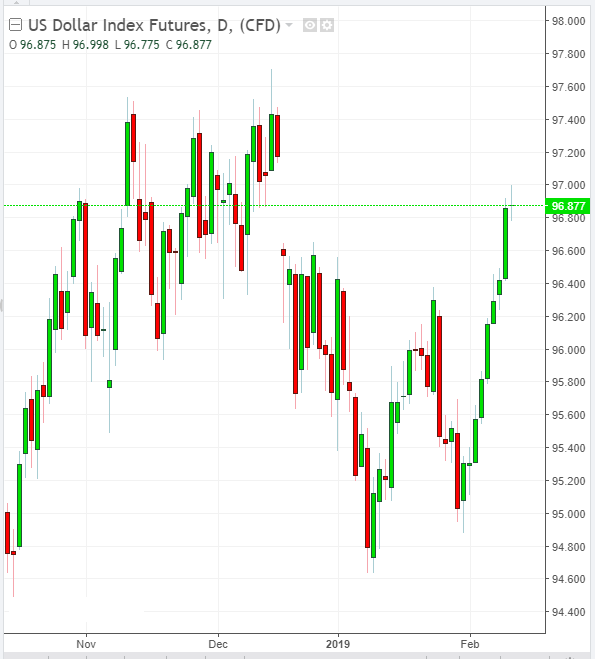 Meanwhile, the growth of XAU / USD stopped after at the end of January this currency pair reached of the next multi-month high near the mark of 1326.00. 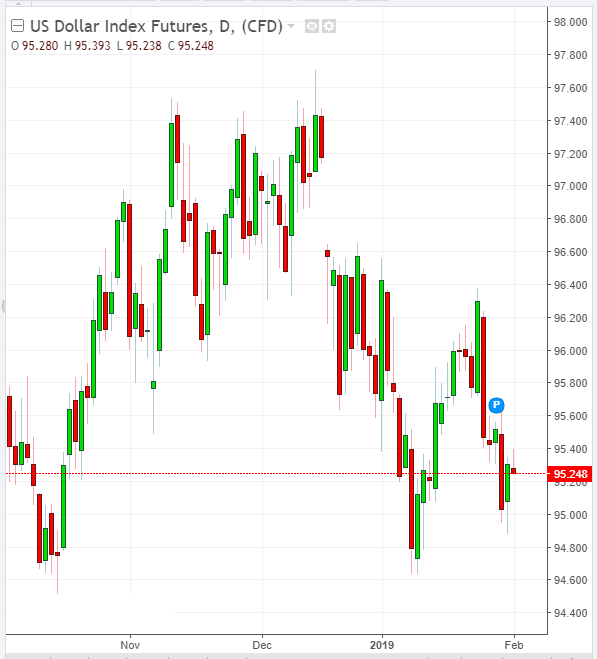 On Monday, XAU / USD broke through an important short-term support level of 1310.00 (ЕМА200 on the 1-hour chart) and continues to decline towards the important support level of 1292.00 (ЕМА200 on the 4-hour chart). In the event of a breakdown of this support level, XAU / USD may decline to key support levels of 1265.00 (ЕМА200 on the weekly chart), 1259.00 (ЕМА200 on the daily chart). Above these levels there is a long-term positive trend. In the case of their breakdown, XAU / USD risks returning a long-term bearish trend with targets at support levels of 1197.00 (November lows), 1185.00 (Fibonacci 23.6%), 1160.00 (2018 lows). After the breakdown of the local resistance level of 1326.00, XAU / USD growth may resume with targets at resistance levels of 1357.00 (2017 highs), 1370.00 (start of a decline wave and Fibonacci level 100%). 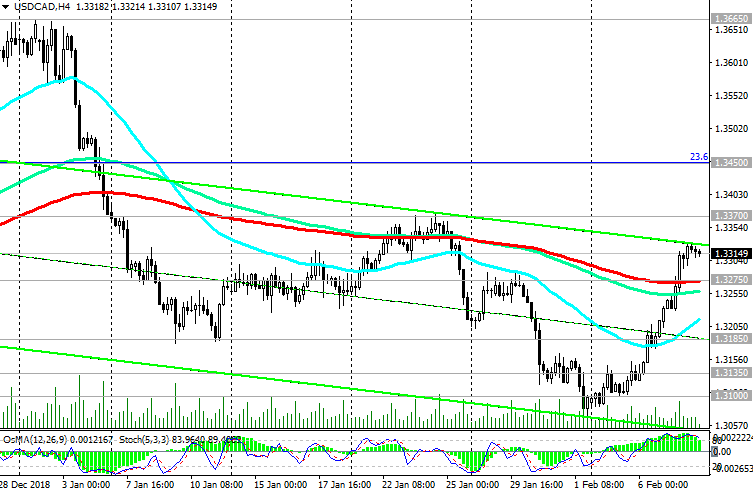 Below the short-term resistance level of 1310.00, short positions are preferable. According to the National Bureau of Statistics of the United Kingdom, the country's GDP grew by 1.3% in the 4th quarter (year on year) against 1.6% growth in the 3rd quarter (the forecast was +1.4%). In December, GDP fell by 0.4%. It was the weakest growth since 2012. The slowdown was mainly due to a reduction in investment in 2018. Many economists predict that in the first quarter of 2019, UK real GDP will grow by 0.3% compared with the previous quarter. In the case of a “tough” Brexit, the British economy may fall into recession. Uncertainty about future relations with European countries will persist for several more years, many economists say. At the beginning of the European trading session, the GBP / USD pair is trading near the 1.2845 mark, and the pressure on the pound and the GBP / USD pair persists. At the same time, many economists see foreign trade as the main source of concern for the global and American economies. This week high-level trade negotiations will be held in Beijing. Investors hope to conclude an agreement before the planned increase in trade duties in March. If trade negotiations are again disrupted, then investor sentiment will deteriorate again, which will lead to a fall in stock indices and an increase in defensive asset prices. The deterioration of US trade relations with China may have an even more negative impact on both the Chinese and the American economy. And this is a negative factor for the dollar. So far, preferred short positions. 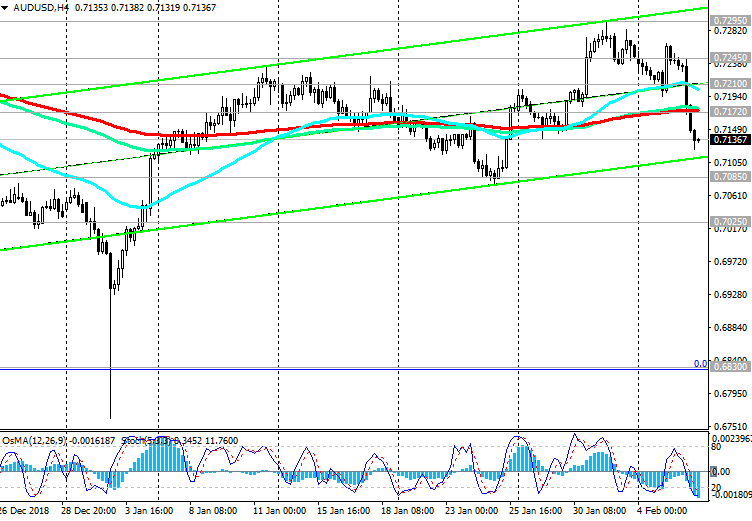 The main trend of GBP / USD is still bearish. The objectives of the decline are support levels of 1.2600 (lows of June 2017), 1.2485, 1.2365. 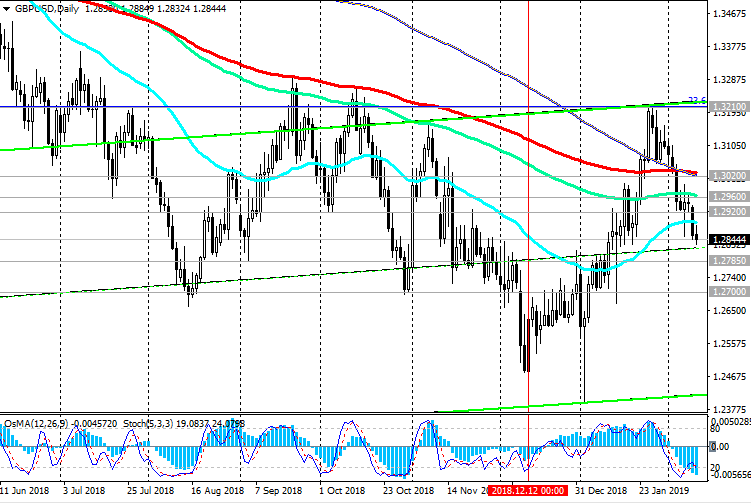 Purchases can only be considered after GBP / USD returns to a zone above the key resistance level of 1.3020 (ЕМА200 on the daily chart) and an increase to the resistance level of 1.3210 (Fibonacci level 23.6% of the correction to the decline of the GBP / USD pair in the wave that started in July 2014 years near the level of 1.7200). The first signal for opening long positions will be the breakdown of important short-term resistance levels of 1.2920 (ЕМА200 on the 4-hour chart), 1.2895 (ЕМА50 on the daily chart). Expectations of a positive outcome of negotiations between the US and China and the conclusion of a trade truce supports investor optimism. US President Donald Trump said on Tuesday that "tariff increases for Chinese imports on March 1 may not occur if we are close to a trade agreement". On Wednesday, investors will focus on the publication (at 13:30 GMT) of US inflation indicators. It is expected that the growth rate of consumer inflation in the United States slowed in January. This is a positive factor for the US stock market. After the December Fed meeting, the head of the central bank, Jerome Powell, repeatedly stated that the Fed could be more patient in raising rates. In his opinion, the central bank is ready to change its policy “substantially” if necessary, and that it will listen carefully to the market. On Wednesday, Powell said that "incoming data suggests that the US economy is in good shape," supporting investors' optimism, putting on further growth of the US stock market. At the moment, the S&P500 index is trying to develop an upward trend above the key support level of 2700.0 (ЕМА200 on the daily chart). Growth targets are resistance levels of 2873.0, 2936.0. Alternative scenario: breakdown of support level 2660.0 (ЕМА200 on 4-hour chart) and further decline with targets at support levels of 2615.0, 2603.0, 2584.0, 2450.0 (ЕМА200 on the weekly chart), 2386.0 (Fibonacci level 50% of the correction to the growth since February 2016), 2256.0 (Fibonacci level 61.8%), which will indicate the break of the S&P500 bullish trend.